Bright crisp days, a snowfall or two, fairy lights in the street and a concert by the Ashbourne Singers – it must be Christmas time. On Tuesday, December 2, St. John’s Church, Ashbourne rang to the sound of the Ashbourne Singers’ second Christmas concert – which already feels like an institution – with carols old and new, a little light blues, some tongue-in-cheek classical music and a stirring rendition of Hallelujah! from Handel’s messiah. The Ashbourne Singers were joined by their younger members, the Young Ashbourne Singers (YAS), who sang songs from musicals and a medley of Christmas songs before the two choirs came together for a moving performance of Jessye’s Carols, written for and made famous by soprano Jessye Norman. The choir had decked the halls of St. John’s with miniature Christmas trees, holly sprigs and wreaths, and the audience was served mince pies and mulled wine at half-time, before being enlisted into a joyful and noisy version of The Twelve Days of Christmas. 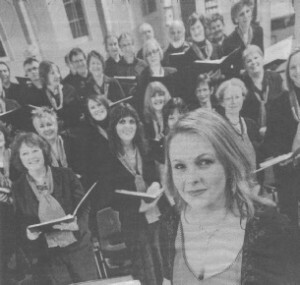 The range and quality of music on offer during the concert reflect the vision and energy of the choir’s inspirational director, professional soprano Linda Perry Smith (pictured with her singers), who delighted the audience with a gorgeous and skilful solo rendition of Rejoice Greatly from Handel’s Messiah. The choir now boasts more than 40 members and a notable pool of musical resources including organist and pianist Michael Halls, pianist and composer and arranger Steve Duckworth, and tenor and pianist Ray Taylor. The choir’s shiny black baby grand piano, purchased with funds raised by concerts and a generous donation from the May Heathcote trust, was a worthy match for their combined skills. Ashbourne Singers will make their next appearance as guests of Ashbourne Town Band at their Christmas concert on Saturday, December 13 at St. John’s Church, Ashbourne and at various carolling events in and around Ashbourne in the countdown to Christmas. It is said that ‘Christmas is for children’ and that was true when YAS joined with the adult choir in the Christmas concert in St. John’s Church. Their young voices complemented the mature ones in a lovely balance through carols and traditional songs. The church, decorated with candles and evergreens, was full once again.